I saw the newest animated Studio Ghibli film this week, コクリコ坂から or From Up on Poppy Hill (dir. Gorō Miyazaki, using a script by Hayao Miyazaki and adapted from the 1980 manga by Tetsurō Sayama and Chizuru Takahashi). 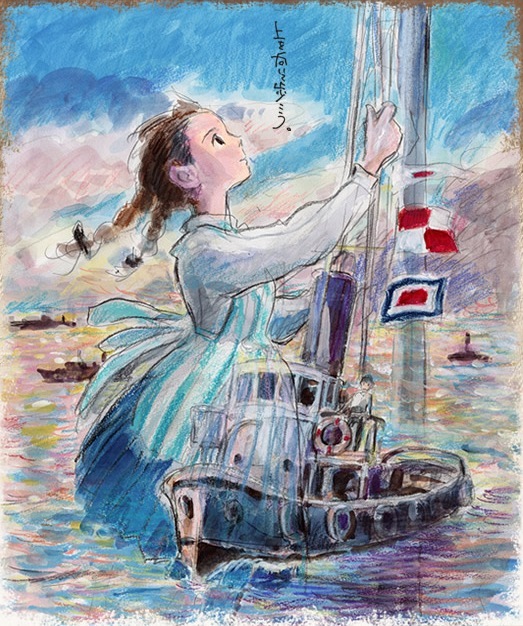 I’ve been trying to see a number of films this summer since I’m in Japan anyway, but it’s set in Yokohama (where I’m studying) on top of being a Ghibli film, so I would have found my way into the theatre sooner or later. Studio Ghibli is best known for those of its films which were directed by Hayao Miyazaki, one of the company’s two co-founders, but its other films are hardly low quality. I may be generalizing a bit too much, but those films not directed by Hayao Miyazaki seem to stray into slightly more adult territory – for example, the possibility of an affair is alluded to in Poppy Hill. The newest film melds this material with a kind of elegiac tone that made for a nice afternoon. Beyond that, I don’t really want to say too much about the film. Being in Japan, I watched it in Japanese, of course, and while I understood enough of the dialogue to enjoy the film, I didn’t quite get enough to feel good about analyzing it to closely. Luckily, Aaron Gerow also saw it and has written an interesting analysis which I suggest you read. Incidentally, I’ve been saving up interesting articles for awhile now, and I’ll probably be unloading a link spam on you soon. If you’ve got any suggestions, feel free to leave them in a comment.